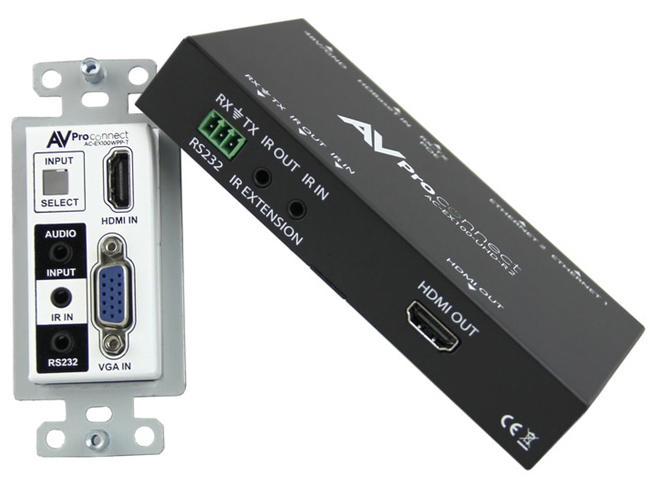 AVPro Edge AC-EX100WPP-UHD-KIT HDMI Wall Plate Extender (Transmitter/Receiver) Kit is currently the world's ONLY single- gang, dual input VGA & HDMI auto sensing HDBaseT Transmitter. Designed to work flawlessly with all PC, it has VESA and resolution support for HDMI 4K 30 (4:4:4) & 4K 60Hz (4:2:0) 8-bit; HDR 4:2:2 12 BIT and VGA DCI 2K, 1080P, 1920x1200x60. The unit transmits HD digital signal up to 100 meters (330ft) and 4k up to 70 meters (230ft). In addition to its superb design, AC-EX100WPP-UHD-T auto senses signal on device connection. 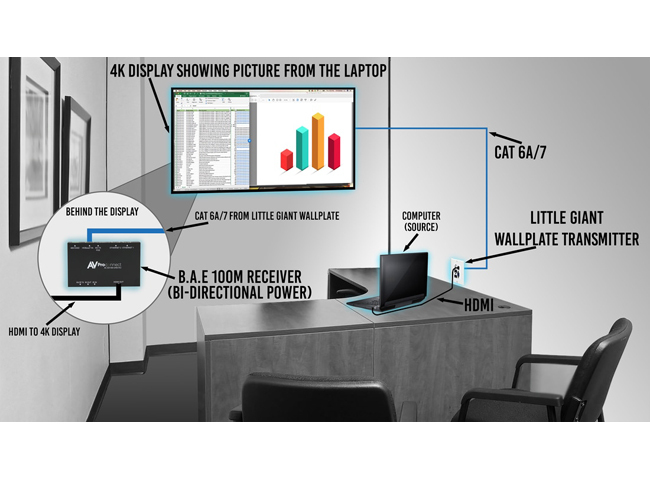 This kit contains the AC- EX100WPP-UHD-T Wall Plate Transmitter as well as AAC-EX100- UHD-R2 Receiver which when paired can power from afar using Power over Ethernet technology, thus eliminating the need for a local power supply unit near the wall plate. The InfraRed & RS-232 compatibility allow control of a rack or standalone projector or display. Other Features include: HDCP 2.2 & Earlier Supported 3.5mm Input for audio only with VGA input Single UTP/STP LAN cable for all signals ESD protection circuitry (Inputs / Outputs) till 7KV. Supports uncompressed DTS, PCM 2- Ch., 5.1, 7.1, Dolby Digital, DTS HD-Master Audio, Dolby TrueHD, Atmos. AUTO SENSING: This wall plate is designed to be a "Set it & forget it" piece of hardware. When the user plugs in their device (BYOD), the wall plate automatically senses the signal and makes it active. If both inputs are in use, there is a simple button on the front to toggle inputs. CONTROL: IR & RS-232 allow control of a rack or standalone projector or display. 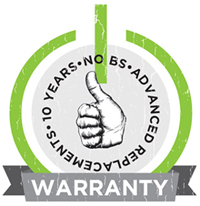 POWER: No local power required when you use the AC-EX100-UHD- R. Power is provided by ultra-stable PoE technology. Optionally you can power it locally for use with any HDBaseT Receiver. SINGLE GANG: Save space and make a squeaky clean installation with the single gang configuration. This wall plate fits in more places than ever! 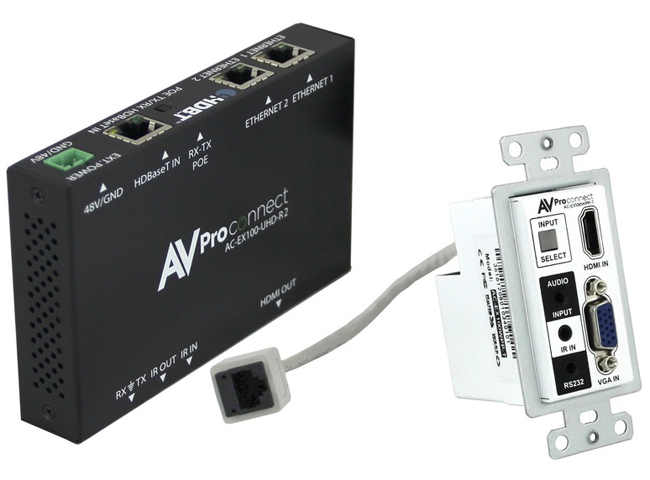 Why not buy this AVPro Edge AC-EX100WPP-UHD-KIT HDMI Wall Plate Extender (Transmitter/Receiver) Kit today?